Time for picking apples, making apple sauce, apple pie, apple crisp, making apple art ... and for reading books about apples. Last Spring I bought a book that I was saving for apple season. There's magic in this bare brown tree. The story starts with the bare brown tree. Jiggling the book, wiggling the fingers, brushing the pages, and blowing a kiss transforms those blossoms into beautiful red apples. A gentle shake drops the apples onto the ground, and patting the leaves changes them to glorious fall colours. And after a wee bit of patience, the magic begins again. Tap the Magic Tree (written in same style as Hervé Tullet's Press Here - another book I love) is interactive - and I beam with delight when children become actively engaged with the book they are reading. The text is lyrical. With gentle rhymes. As if in awe of the magical process that the tree undergoes. That magic is shared with the reader - who almost becomes a magician - through the tapping, and brushing and shaking and clapping. The illustrations have a gentle yet stark simplicity forcing the tree to be the focal point of each page spread. The solid brown trunk and branches are identical each time, with textured collage leaves, buds, apples and snowflakes adding the details to each season of the apple tree. The change that happens within the tree is echoed in the background colour of the facing page - pink for blossoms, red for apples. The text and illustrations work beautifully together to draws the reader to join the magic of the apple tree. The Pageturn: an inside look at books has a Common Core (for all the American folk) aligned teaching guide available for free download and a link to a Tap the Magic Tree trailer. 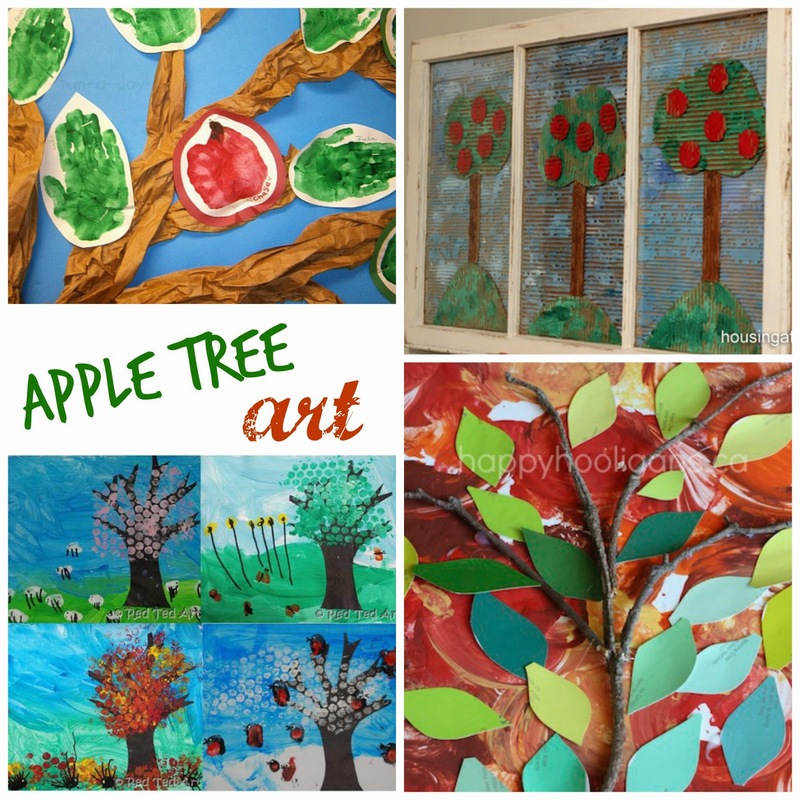 Christie Matheson's apple trees inspire other apple tree art. Here are some apple trees that caught my imagination. Enjoy this clip of Christie Matheson and her daughter doing some apple tree art. What a great book! I like the interactive aspect and that it covers all the seasons. This will be a good one for my book bag to take to school! Thanks! I bet all your 2 legged reader friends would enjoy interacting with the book. It is pretty cool. Carole Fullerton includes that book in her latest ebook - Math and Literature! Some great math activities connected with that book! I am going to have to check that out - thanks. I'm Robin and I'm a student at the University of South Alabama. I was introduced to your blog from my EDM 310 class and starting this week we are commenting on a teacher's blog and also I will create a follow up blog post with a summary of what I commented to your blog. I am excited that I was assigned to your blog to see all that you have shared in your posts! I really enjoyed reading your post about the book Tap the Magic Tree by Christie Matheson and the creativity it can bring to the classroom. I really like how you organize your blog posts in a way that kept my attention and I wanted to keep reading to find out more about the apple trees! The links that you provided on more creative activities with apple trees will be very helpful if I ever do an activity with this book in my future classroom. Thank you for sharing this book and great job on your blog it is very informational and also fun at the same time! Can't wait to see what you share next time in your blog! Hi Robin! Best wishes with your university class. As a wonderful school librarian who worked in my school (back in the day when we had someone in the library on a regular basis),used to say: some many books, so little time. This book looks fabulous! I love a good apple unit, and this is a PERFECT addition! Thanks for much for sharing this at Booknificent Thursday at Mommynificent.com! Hope to see you again soon!